Some frequently asked questions about the series. What races form the Series? Every round has races for each age group, from U8 to seniors. While U8 and U10 have their own races, there is no overall ranking for them in the championships, instead every participant will receive a wee prize in the finish. There will be no U8 and U10 races in Tallinn CX, due to it being national championships and running by stricter UCI rules. Do I need a national governing body license to race? No, license is not required for races, with one exception. You need to have a valid license to race Tallinn CX, the Estonian Championships in CX. What bike do I need to have? If you are younger than 12 years, then there are no limits, grab your bike and come. If you are between 13 and 16 years of age then you can use a MTB bike, with tyres no wider than 35 mm. All the rest need to have a CX or road bike, with tyres no wider than 33 mm. How are tyre widths measured? For the Tallinn CX (Estonian Champs), tyre widths will be measured before the start with a special tool. For all the other stages, competitors are required to ride on tyres which have original manufacturer’s label with tyre width (up to 33 or 35 mm, according to the age group) clearly visible on the tyre. No other tyre width measurement will take place but it will be possible to have one’s tyres voluntarily checked with the same tool as used in the Champs. On the day registration is possible for stages I, II ,III , V and VI. Is there a timetable for the races? 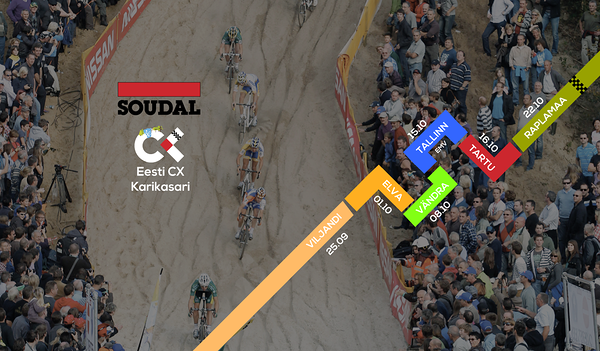 Yes, all races beside Tallinn CX follow the same timetable. Do I really have to be there at 9.00 in the morning to get my race numbers? No, you can get your numbers up to around 10 minutes prior your start. Still, we recommend not to leave it all too late, no-one will wait for you when you are late! What is the OPEN Elite race, is it only for pros and elite riders? No, OPEN Elite means just that all men between the ages of 18 and 49 years race together. I will probably be lapped quickly, is that the end of my race? No, far from it! You can race for the whole duration of your race and finish on the same lap as the winner, with an exception of Tallinn CX (UCI rules again). If you have been lapped then you don’t have to ride those laps, final protocol will display how many times you had been lapped. I am older than 49 years, can I start in the OPEN Elite race? Yes, everyone feeling young enough can start in the OPEN Elite race. Yes, of course! In every stage, respective age group best will receive a prize according to the stage rules. In addition, six best riders from the OPEN Elite race will receive monetary prize. For the series overall, three best riders from respective age groups will be rewarded, prize ceremony takes place after Rapla CX. Why should I come and show my lack of skills and fitness, even my cat is faster than me? Don’t you worry, CX is one of the friendliest disciplines there is. There is always someone to race with and placings don’t matter, just come and enjoy a great day with your bike! Moreover, CX is for the whole family, bring your kids and cats and dogs, there is nothing more rewarding than being cheered on by your family while you are fighting to stay upright and can barely breath. Fire them away to info@cxeesti.ee and they will be answered shortly!